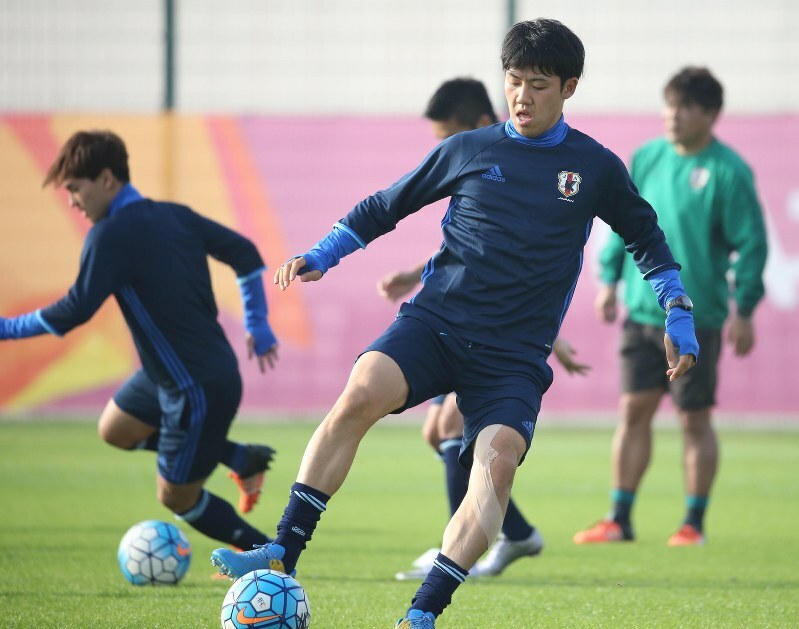 DOHA -- The Japan under-23 national soccer team is preparing for its semifinal match here against Iraq on Jan. 26 in the AFC U-23 Championship, with the top three teams in the tournament earning tickets to the Rio de Janeiro Olympic Games this summer. The match will start at 4:30 p.m. local time, or 10:30 p.m. Japanese time. If Japan wins, it will be the 10th time for the Japanese under-23 soccer team to qualify for the Olympics, and the sixth time in a row. If Japan is defeated, it will play the loser of the other semifinal match between hosts Qatar and South Korea on Jan. 29 with the winner of the third-spot playoff claiming a spot in the Rio Olympics along with the two finalists. Japan's head coach Makoto Teguramori said, "So far we've played against Iraq twice and lost both times, but if we don't get past Iraq we won't be able to see the world (and play at the Olympics). We will do all we can to win." On Jan. 25, the Japanese team kept its activities other than the beginning of its practice secret, as it made final preparations for the game. As part of the competition's knockout stage, the match will last the regular 90 minutes, with two 15-minute extra time periods in the event of a draw, followed by penalty kicks if the game is still tied. In the matches until now, in order to save the team's strength, Teguramori has varied the starting lineup. However, he says, "For the game on the 26th (the semifinal) we will put it all on the line. We can't hesitate to use our strength." Teguramori will put together the strongest team he can, while keeping an eye on forward Musashi Suzuki, who was suffering from a leg injury, and midfielder Wataru Endo. The aggressive Iraqi team combines power and speed and actively uses long balls and the width of the pitch to attack. Their midfielders Humam Tariq and Ali Husni are strong dribblers. The team's tall forward Ayman Hussein was the source of two goals scored from long balls in the quarterfinals. In its matches so far in the tournament, the Japanese team has often found itself in trouble when the other team capitalizes on loose balls. "It's dangerous when they get the ball behind our players and we have to scramble," says Endo. An important point that will decide the match is whether the Japanese side can play tight to the opposing team while keeping control against a team that is good at stealing the ball. Japan has enjoyed three days' rest between matches for the first time this tournament, while Iraq will have had two days' break. To capitalize on this advantage, the Japanese team should stay calm and try not to let Iraq score first. Even if Japan loses its semifinal, it can obtain an Olympic spot by winning the match for third place. However, the opponent would be either Qatar, who has the momentum of being the host country, or South Korea, who won the 2014 Asian Games in Incheon, South Korea, whoever loses their semifinal match.